Bob Boardman has Stage IV cancer. The doctors have given him six months. Yet Bob has already lived nearly 64 years longer than anyone could have imagined. "I looked up and saw the other two young fellows making their way back toward our lines and I tried to yell to them, "Help me," but nothing came out. I remember vividly opening my mouth to yell and I remember the looks on their faces filled with fear. It seemed like we locked eyes for a long time, but I'm sure it was just for a moment. They thought the lieutenant and I were done for, so made their way on. They were just kids, as we all were, but this was their first campaign." "I thought about using [my pistol] with my left hand and then for the first time realized that I was having trouble breathing. Soon taking each breath was like what I imagined drowning to be. Then I figured out that this must be it. We used to talk about the bullet with your number on it. But I had become a Christian about 22 months before this, and a deep peace in Jesus Christ prevailed at this moment." Amazingly, Bob lived through that day, though he never was able to speak again above a husky whisper. But Christ had begun a good work in him, and Bob was not a man to wallow in misery or bitterness over his condition. Instead, he returned to Japan in 1952 as a missionary to his former enemies, where he and Jean served faithfully for 33 years. He later went on to publish three books: Unforgettable Men in Unforgettable Times, C-Rations for the Warrior's Heart, and Higher Honor. I didn't have the privilege of meeting Bob until 1995, and then only briefly, when he returned to Okinawa (where I was stationed) to pray over that place where he fell with a hole through his throat 50 years previously. As we stood with a small clutch of believers around Bob and Jean, we rendered him a salute to thank him for his service and his sacrifice, both for our country and for our Lord. May this serve as one more salute before you go ahead of us, Bob. I look forward to hearing you sing in glory, dear saint. Well done, good and faithful servant! Update: Bob Boardman went to be with Jesus on September 19th, 2009. Final tribute here. Bob was a good friend who inspired many to labor in the harvest. I am one of the many. Great testament, Jailer. Thanks for sharing it with us. Beautiful Story. I'll have it on the front page tomorrow. Thanks for posting this story. Awesome stuff! I pray we don't take men like BOB for granted.And that go'es for those Men and Women today, who are trying to make this world safe. Thank you for sharing Mr. Bob's story. And what an amazing story it was. My prayers have gone up for him and his family and I passed the link on to a Marine friend of mine who will also help share his truly inspirational story with others. 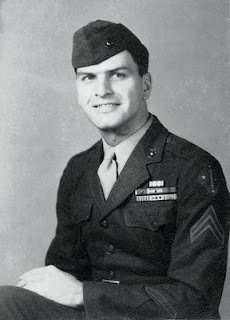 Semper Fi Bob Boardman and thank you for your service. I will remember to keep Bob B. and his family in my prayers. May God hold Bob in the Palm of His Hand. He has been blessed with a great life. And we, as Americans, are blessed that he is one of us. Thank you I enjoyed his review. and this post. Great story! Will have to share this with my ROTC cadets! The peace of Christ for those who believe....an awesome reality. Breath-taking, gut-wrenching, and encouraging. Thank you for sharing God Bless and Thank you for your service!!!! That's quite a story...encouraging. I'm praying for Bob in his latest challenge. What an amazing story..a true warrior..Thank you for sharing. What an inspriring story of courage and faith in action. Thank you for sharing. Thank you for the post. . .I met Bob at a Navigator's meeting at NAS Whidbey Island in 1998 where he told his salvation story and relayed his struggles as a Christian throughout his many years of ministry. His story is a profound message of grace and forgiveness. . . I forwarded this to my husband who forwarded it to his brother, a former marine and Korea Vet. It is a great story.